Dillistone Group Plc, the parent company of GatedTalent and Dillistone Systems, gave an update to the Stock Market on the performance of its new GatedTalent platform. The product, launched in October 2017, has grown rapidly and is now believed to be the fastest growing Executive Search technology in history. – Executives from 90 countries have created profiles on the platform with the United States as the fastest growing market. – Membership growth accelerating, with June 2018 expected to be the best month to date. 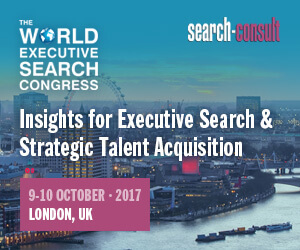 – Highly senior-level talent pool – CEO is most common member job title. 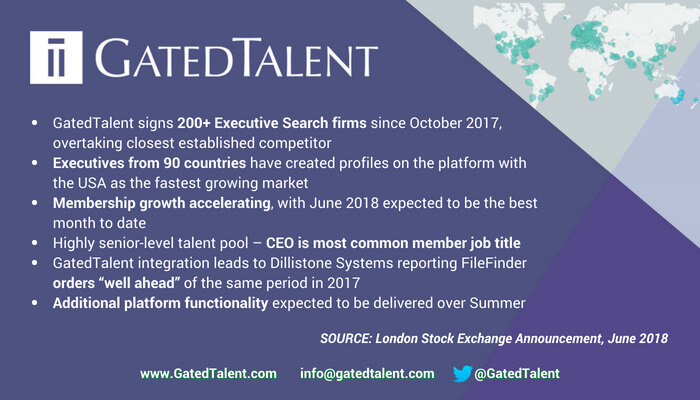 Jason Starr, CEO of Dillistone Group Plc commented: “GatedTalent has proven to be transformational for both us and its users. It’s the platform that allows our Executive Recruiter clients to find and engage with senior-level executives in a manner that lets the executive maintain their privacy. It allows an executive to be found by recruiters in a manner that will not be seen by colleagues, shareholders, employees or the boss (for those Executives who actually created a profile). One of our clients described it as ‘A private LinkedIn’ and I think that’s a great description. Dillistone Group Plc is a leader in the supply and support of software and services to the recruitment industry. It has five brands operating through three divisions: Dillistone Systems, which targets the executive search industry; Voyager Software, which targets other recruitment markets; and GatedTalent, the next generation executive recruitment database.